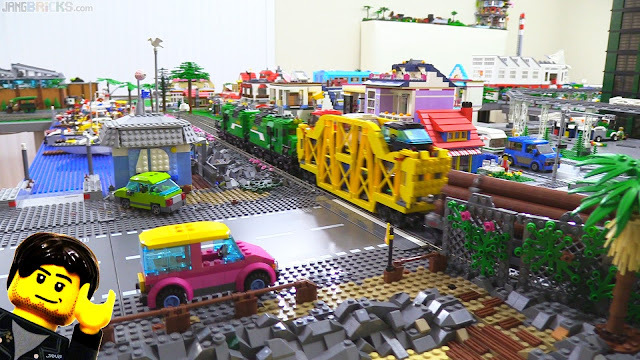 There's been lots of New Jang City work over the past week since I recovered from my sick time, and the latest big batch of changes really cascades the benefits of my west side expansion across the entire layout. I've moved a lot of rail (both gauges) and an entire street, with positive effects from end to end on both current items and my future plans. It's all gelling! 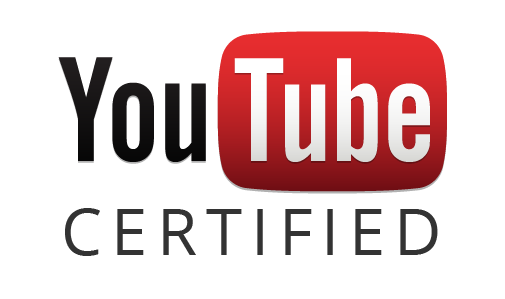 This past week I was able to go through a Google-administered online training course and examination to become officially "YouTube Certified" in the art & science of "Content Ownership." This alone doesn't mean much of anything for the JANGBRiCKS channel, but the process educated me on some of the back-end workings of the YouTube automated copyright protection system. It also puts an invisible flag on my account that effectively raises YouTube's trust in me, a major step towards gaining access to tools that'll facilitate better protection of my own content in the digital copyright landscape. Unfortunately nothing in this process translated into any new video content for your entertainment, but there will be more on that front soon! Hey all, I just wanted to post a bit of an update on the recent reduction in my upload rate. About a week ago I gave myself some time for a much-needed reprieve from the 7 day/week work schedule, to be a little more present around the house, catch up with friends, and play some video games. Then, a few days ago I fell a bit ill with something that has kind of knocked me off my feet and ruined my focus in waves. Right now I'm spending a lot of time resting so that I can get back to full strength. I've tried working on some builds from the couch, but found my brain to be too scrambled to do things right. So, I'm going to wait this one out. The best thing that could have happened to me today? If you haven't heard by now, today was the launch of the biggest & biggest-deal LEGO set of all time, the second UCS Millennium Falcon. It was also another frustrating day for countless fans who experienced outages & errors on Shop at Home (as on every. single. major release day) and ludicrous shortages at brick & mortar locations. I encountered exceptionally bad traffic on my way to my nearest LEGO Store this morning, arriving 1.5 hours after I departed, just in time to see one of the $800 sets rolling out to the parking lot with its new owner (who had staked out the store since a little after 5am). Before it, I would soon learn, had departed only two others. To reinforce the arithmetic, I've just accounted for a total of three UCS Millennium Falcons leaving this site. Three. Also known as "a few." 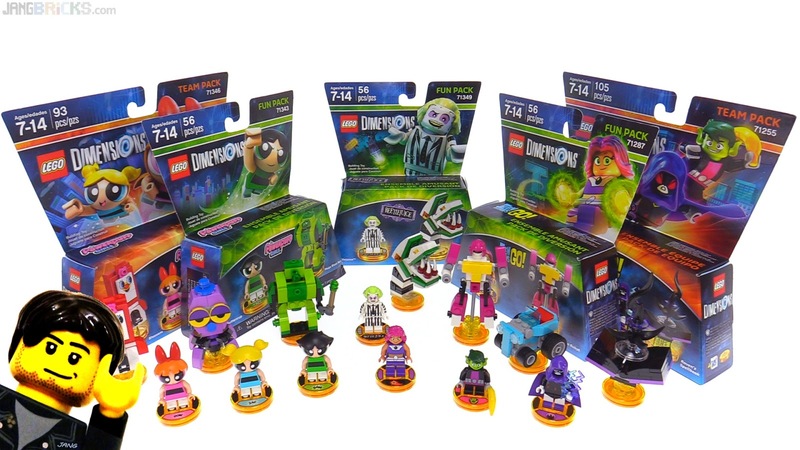 That is the total number of sellable copies of the single largest & most-anticipated toy that were available at this brand storefront of the largest toy brand in the entire world. You might think I have a run-down, forsaken LEGO brand store in a particularly poor retail location. However, in the parking lot right outside was a Maserati, a Bentley, and more Teslas, Benzes & Bimmers than I cared to count. Also, from what I've since heard, there were other LEGO stores that received the identical allocation of "a few." The largest numbers I've heard of so far were in the mid-teens. Nearly three hours after I left my house, I had returned, disappointed, but pondering whether to venture back out the following day per the store manager's suggestion that additional stock might arrive overnight. Once again I considered the long drive and how early I'd need to embark. I mapped out an updated best-case schedule in my mind with at least 4 hours of near-zero productivity just to buy the thing and put up a quick "look I got it, I'm going to build it, it's as big as you know it is, please be patient" video. Then would come an estimated 2 days for building, publishing the time-lapse build, and prepping the studio for the review. A proper review would take at least another full day to create. After all of the dust settled, I would then need to figure out what to do with the completed monstrosity. I have no place to display it. I have no interest in re-arranging any major part of my house to create a space to display it. I personally have little interest in owning this thing. Meanwhile, sponsored media outlets received the product a week ago and some have already completed their builds. What am I doing?! This is madness! 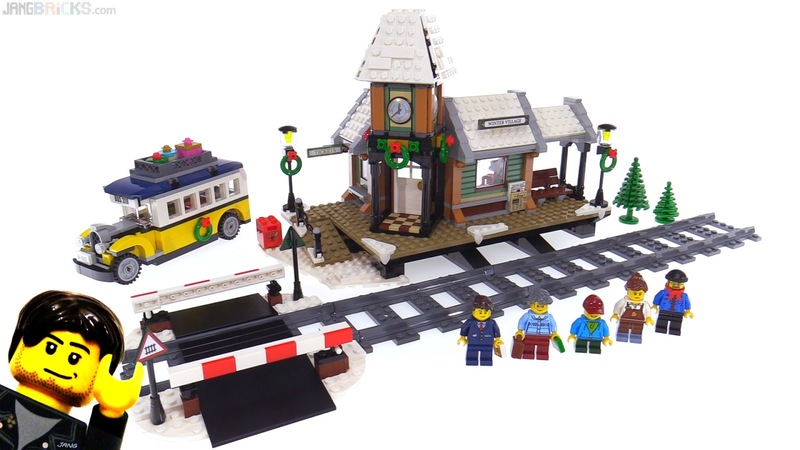 I'm pressuring myself to spend nearly $900 USD (tax is a thing) on one single LEGO set, that I don't personally want, to then spend a further 3-4 days building & filming it (with no time for anything else), to publish a review video that will provide little to no value to potential buyers (who've already bought it or at least tried), and be left with a huge burden of an object I don't know what to do with. I'm confident it would be a huge waste to proceed, probably the dumbest decision I'd have made with respect to any hobby ever, and certainly a bad choice for you viewers. The amount of original content I can create with that outrageous sum of money and/or that shocking number of hours makes the option of toiling to publish one of 30 or 40 UCS Falcon YouTube reviews (all showing the exact same things) seem... inadvisable. Of course not everyone will agree, but my decision is not up for debate. I will not be returning to the LEGO store tomorrow. Will I ever buy the mega-Falcon? I won't rule it out 100%, but I'm looking forward to doing a lot of better things with my money & time before I even begin to consider it again. Talk about a blessing in disguise. 63 comments - Post a response! 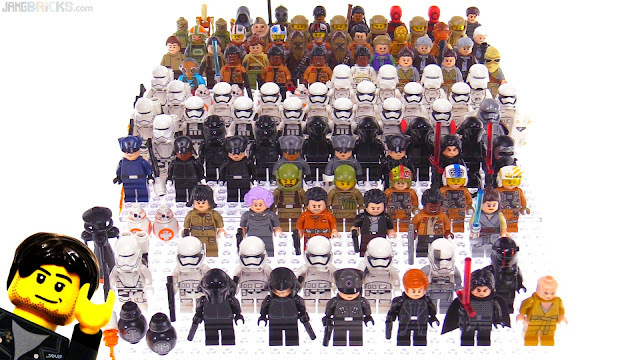 LEGO Star Wars The Last Jedi & TFA minifigs so far! A quick look at the sequel trilogy minifigs & droids that have accumulated up to this point, as well as a comparison between the TFA & TLJ collections as things currently stand. Expect a lot more to come for the latter, and not much more for the former. 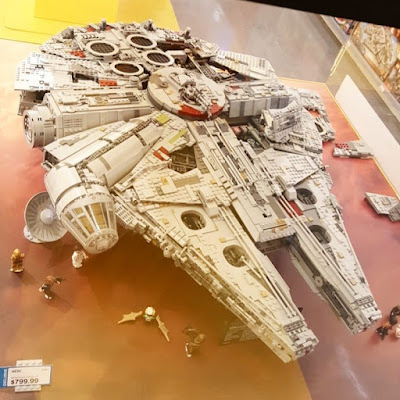 Video: LEGO Star Wars The Last Jedi & TFA minifigs so far! Yet another different agency processing some of LEGO's promotions has sent over a box of stuff, this time the as-yet unreleased final wave of Dimensions boxed sets. No word yet on the Lord Vortech release. 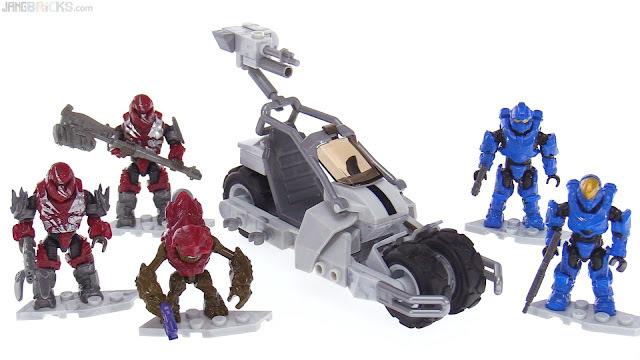 Mega's Halo-related releases have slowed a bit recently, but this is a nice figure pack with a good small vehicle from Halo Wars 2.